Retailers all over the globe jingle all the way to leverage the power of Big Data and Beacons. For them, consumer data insight is one such key matrix to maximize profits. This data means sharp campaigns, best resource management and excellent personalization for communications with customers. By analyzing the behavior on online websites, major retailers can track individual customer actions. Additionally, such larger data repository enhances customer experiences in a smart way. But currently, that is not the case. What’s holding them back? Is it necessary to treat every customer that visits your store in a same way? Is it necessary for every customer to view the same offers and discounts? The answer is big ‘NO’. Real time personalized offer collects the customer’s traction in real- time and offers the customized offer to the customers. Beacons are not only known for driving the contextual content but also responsible for understanding the customer’s shopping behavior. It offers the accurate insights of in-store behavior, brands, favorite products, demographics, location and more. This enables you to increase the personalized initiatives and boost profits & retention. For instance: Segmenting by 35-40 years old women shoppers is drastically different from 25-35 years female. Hence, they should receive the messages that reflect their needs. Beacons placed at the store’s physical location are connected with the mobile application on customer’s smart phone. It will recognize the customer shopping inside the store by acquiring necessary information like purchase history, response towards advertisement campaigns, offers and discounts used etc. Additionally, with the help of Big Data and Beacons, you can optimize your store layout and product placement by finding the popular location based on navigational patterns. Dwell time is the most critical insight that enables the retailers to push instant notifications with the best offers related to particular category. By tracking the customer’s dwell times at different sections, you can make out which section is the best to generate and optimize more ROI. Customer movement inside the store is extremely useful to the retailers as it is based on purchase intent. Heat map analysis and customer movement tracking can be done precisely using Big Data and Beacons to spot areas which are used more frequently, products which get the highest consideration etc. It enables the retailers to organize about where to place trendy & non-trendy and expensive & non-expensive merchandise. This tactic also helps to solve the pricing problems. For instance, many people are just touching an item but some are only buying it, this means that product is expensive or not up-to the mark. Big Data and Beacons would make it possible for retailers to realize that an item isn’t really worth selling and should be placed at a less prominent place. Heat Map analysis provides the insight that helps the retailers to run relevant, contextual, location that increases sales and ROI. 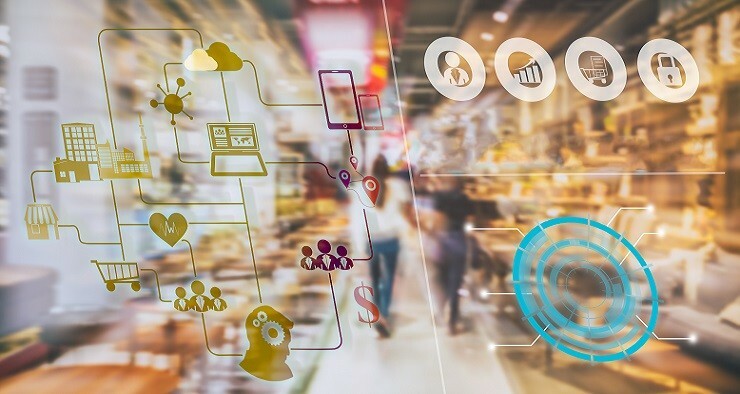 Retailers can analyze the accomplishment and breakdown of an advertisement by checking the insights such as number of offers viewed, offers used, closed and shared on social media to make out valuable conclusions. Additionally, make sure to keep an eye on traffic before you initiate the ad campaign, to have an actual comparison. Remember that advertising often has a increasing or decreasing outcome, so ad-driven sales may not become visible immediately. Furthermore, you can also make the use of phone lines to track your phone orders. This analytics drawn by Big Data and Beacons helps the retail business to generate more traffic through promotional events, product launch and exhibitions and hence, driving them to purchase more. The interaction that is done through beacons doesn’t have to be device to device. The moment beacon recognized the customer; all information about that customer can be shared with the sales associates. This empowers them to welcome the customer by name, by being more personalized. Today, store owners look to provide more power to the sales associates with a 360 degree view of every customer. Sales associate has the data of purchase history, location, shopping preferences and social profiles. Such critical data about your customer to sales associates guides them to get an enhanced idea on how they should come close to the customer. When we implement the concept of Big Data and Beacons, it is extremely crucial to locate, gather, relate and find the insights of right data for the growth of your business. Using beacons and Big Data, you can enhance customer experience, improve business process and generate more revenue. Amalgamating this power couples enables the data-driven and win-win business strategies for your brand and customers. So, any thoughts whirling in your mind? Connect with us; we will strive to make it the best!